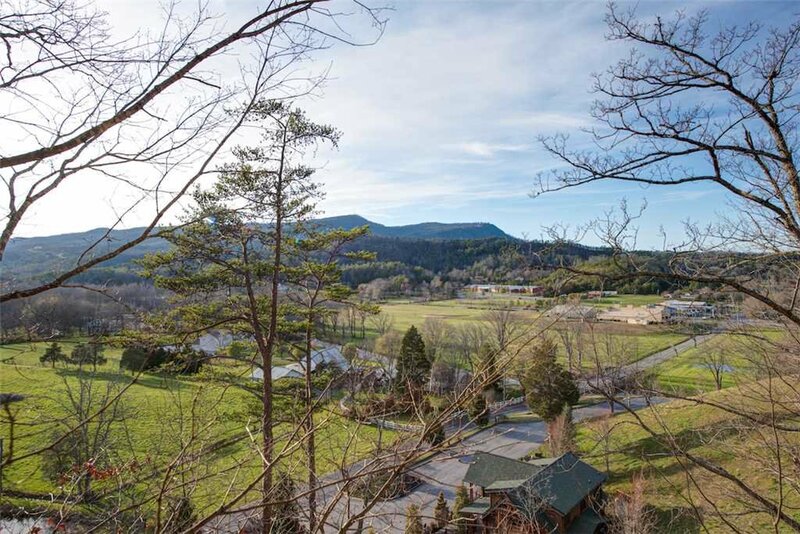 When you stay at Mountain Paws Retreat, you’re close to the area’s most popular attractions, yet you’ll feel blissfully removed from the traffic and the hubbub. 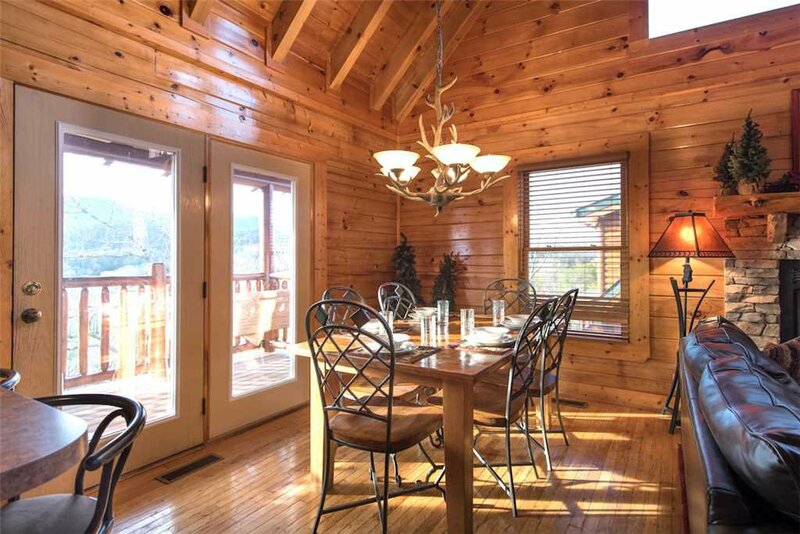 And because the lodge has five bedrooms, you can invite friends or your extended family to enjoy the serenity and the stunning mountain views with you. 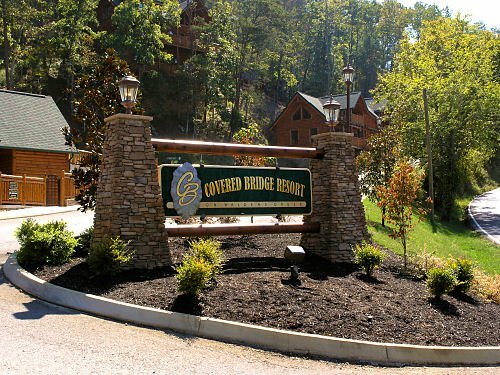 Mountain Paws Retreat is located within the Covered Bridge Resort in the Wears Valley, sometimes called “the quiet side of the Smoky Mountains.” You’ll be charmed by the bucolic setting even before you drive onto the covered bridge that spans Waldens Creek and gives the resort its name. 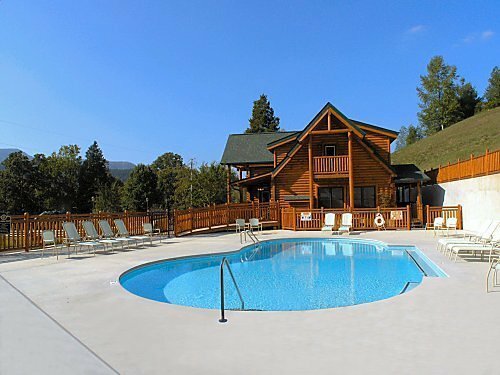 In summer you’ll have free access to the resort’s outdoor heated pool. 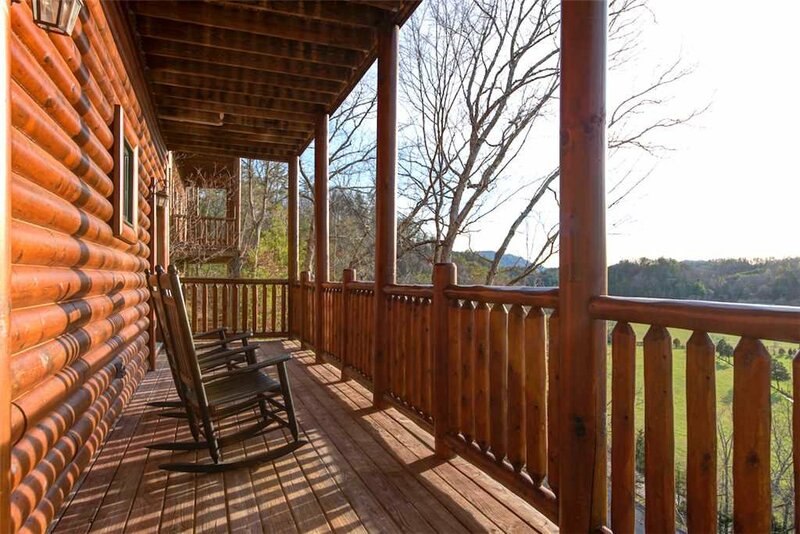 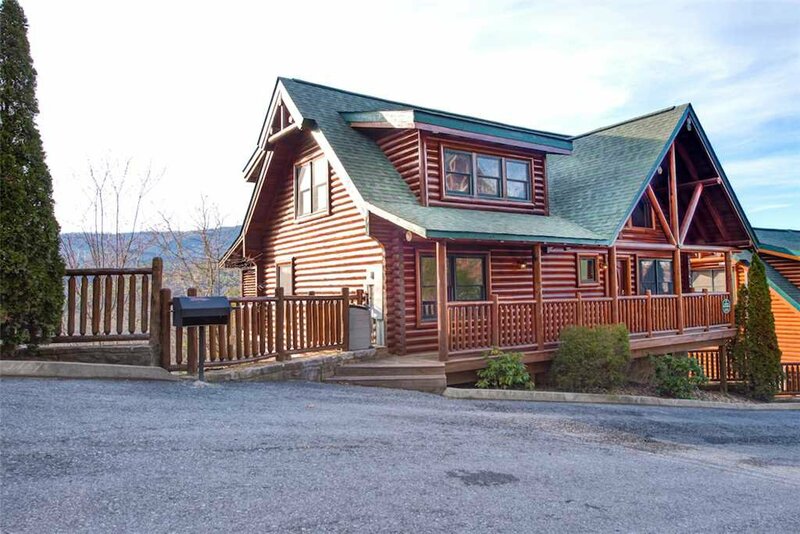 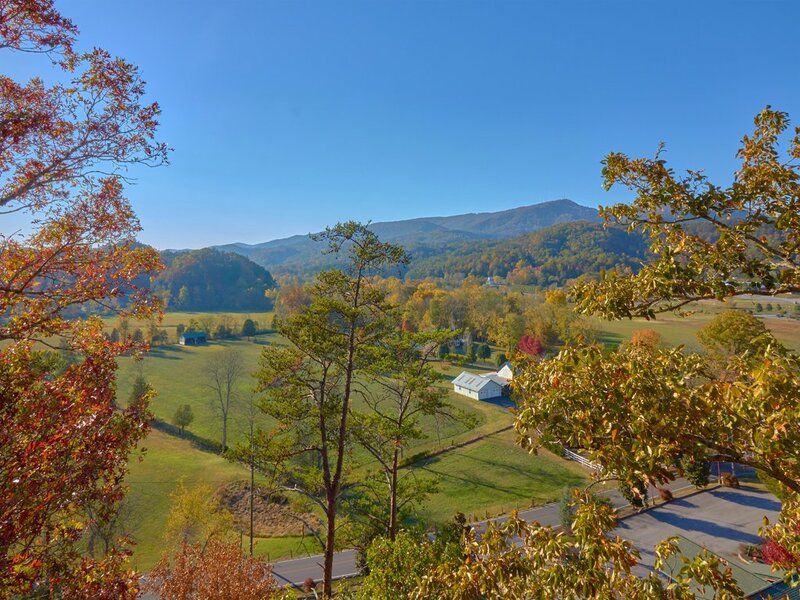 And year-round you can take advantage of its proximity to the Great Smoky Mountains National Park, just ten minutes away. 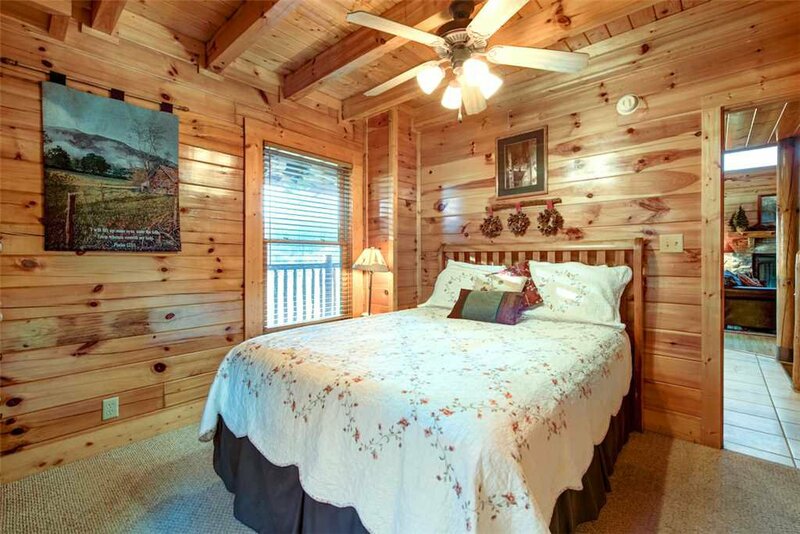 What’s more, the Pigeon Forge Parkway, home to the Titanic Museum, dinner theaters, a huge outlet mall, and more, is less than twenty minutes away, as is Dollywood. 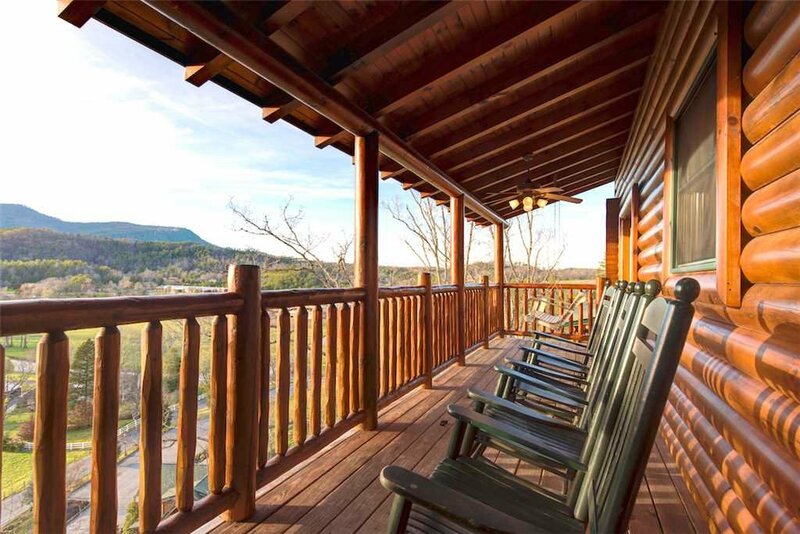 The lodge’s two covered rear decks, which stretch across the width of Mountain Paws Retreat, look out onto Bluff Mountain. 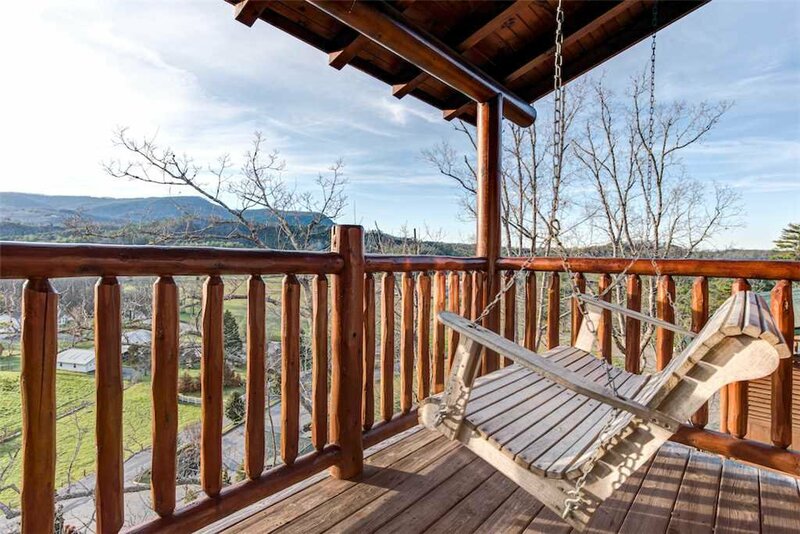 Thanks to ceiling fans, you can savor the view from the numerous rockers even in the middle of summer. 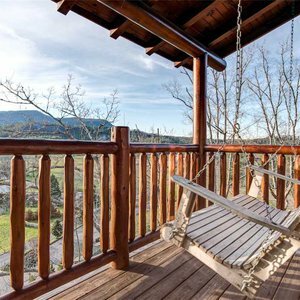 A deck swing is an especially romantic spot for gazing up at the star-studded night sky with your special someone. 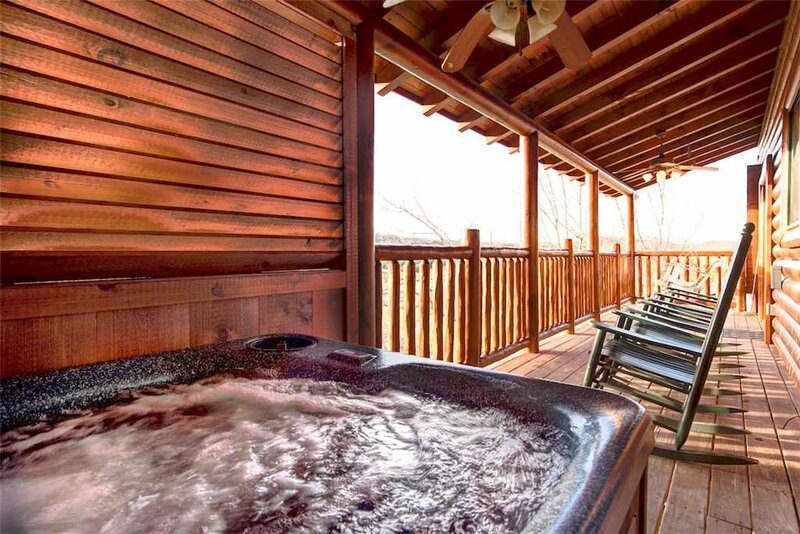 And especially after a day spent hiking, biking, or whitewater rafting, you’ll relish soaking in the outdoor hot tub; there’s nothing like massaging jets of steamy water to revitalize weary muscles. 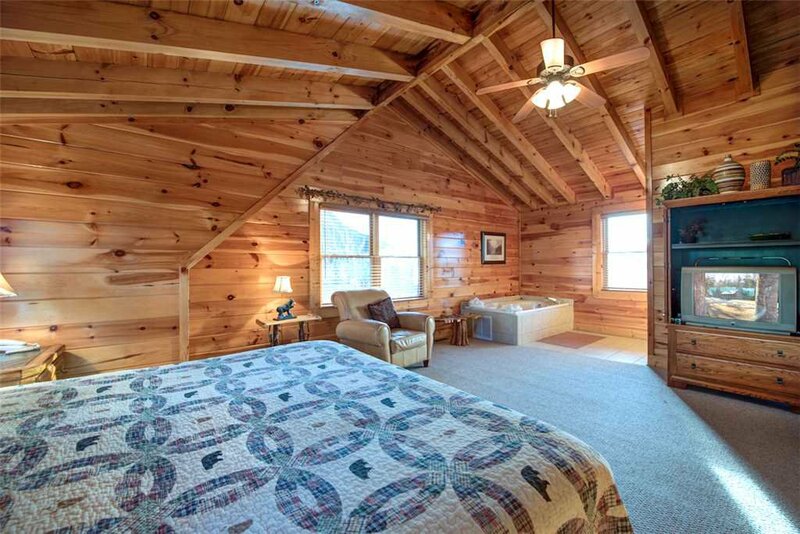 The main level’s great room is a comfortable, charming space for relaxing with the gang. 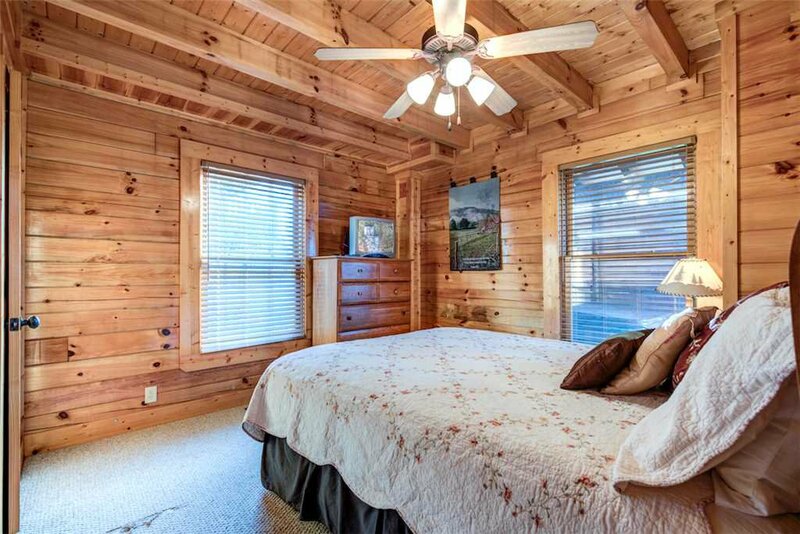 Large windows in the double-height walls let in plenty of sunshine, and the vaulted ceiling adds to the open, airy ambiance. 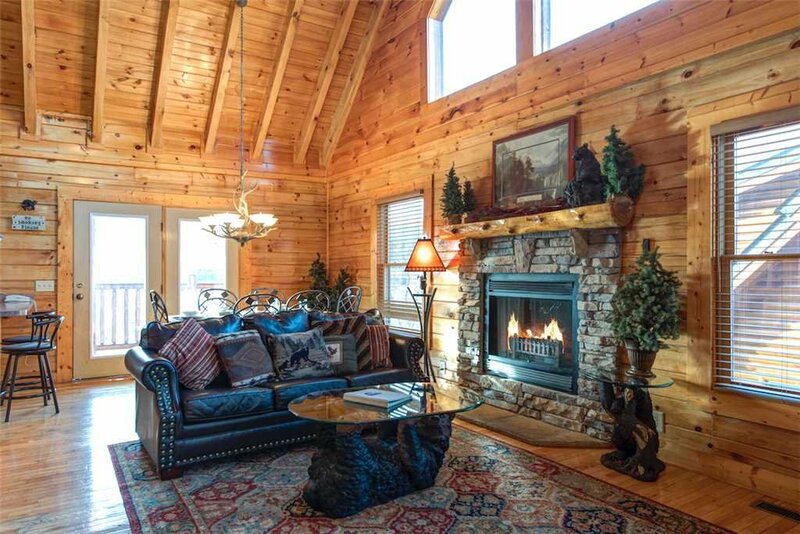 The leather couch and the generously proportioned armchairs complement the wood-planked floors, walls, and ceiling to perfection. 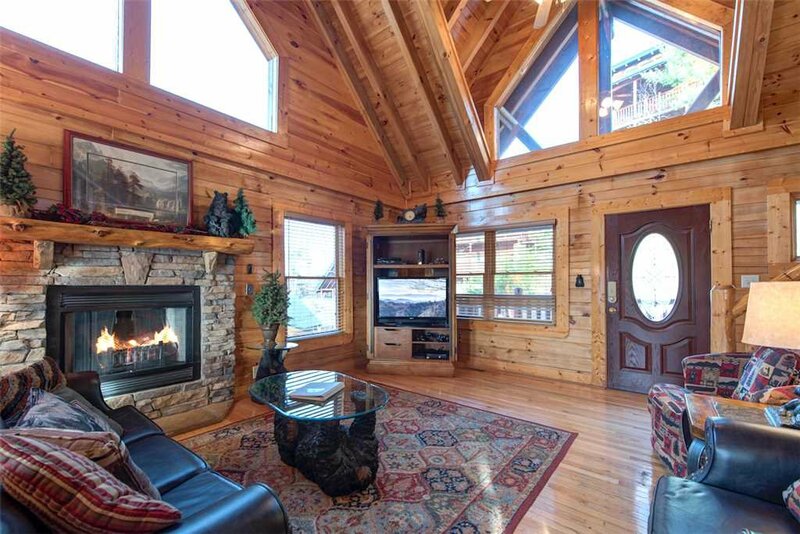 Whether you’re sharing popcorn and watching a movie on the TV with cable and a DVD player, enjoying après-ski drinks by the stone-surround fireplace, or curled up in a chair with a stack of magazines, you’ll feel wonderfully at home. 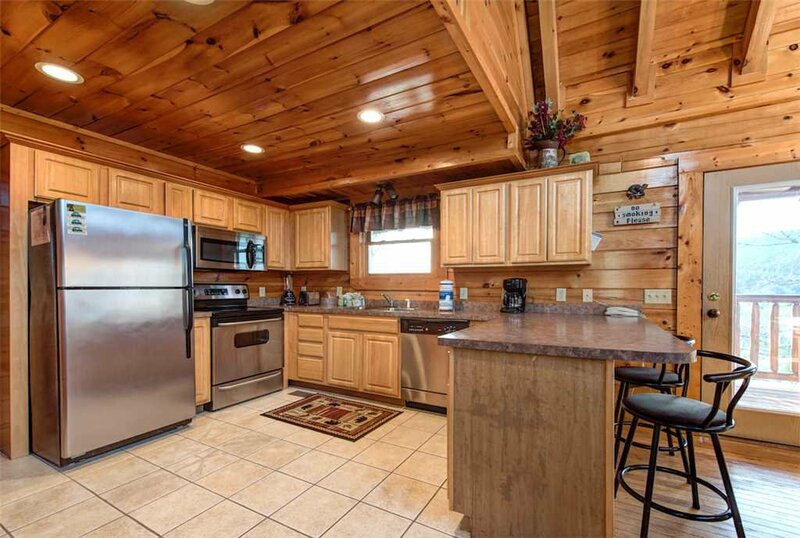 The dining table seats six people with room to spare, and two more can sidle up to the adjacent breakfast bar. 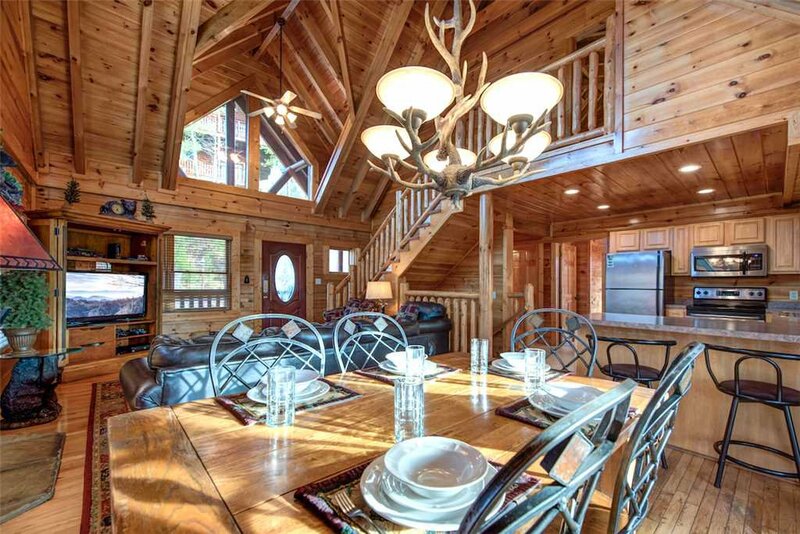 When you’re not enjoying a meal, you might want to use the table to play board games—the well-cushioned seats are comfortable enough to encourage lingering. 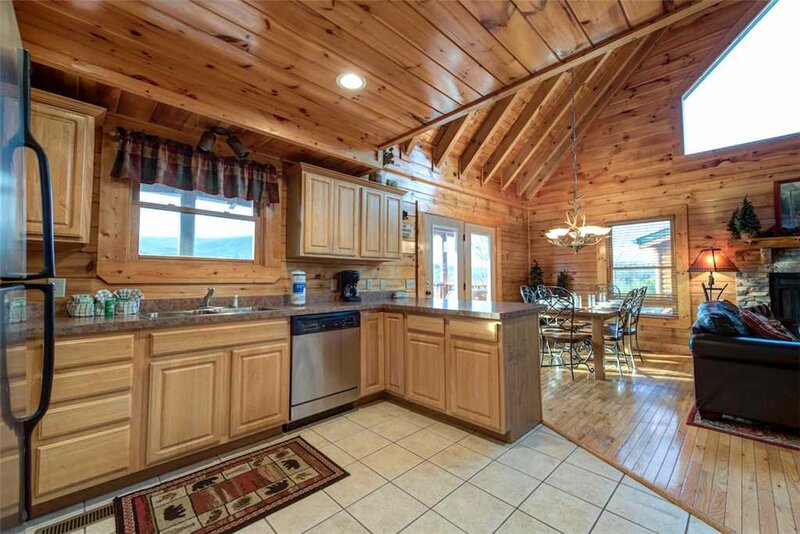 Just as important, Mountain Paws Retreat’s spacious, open kitchen is fully equipped with stainless-steel appliances, gadgets, cookware, and tableware. 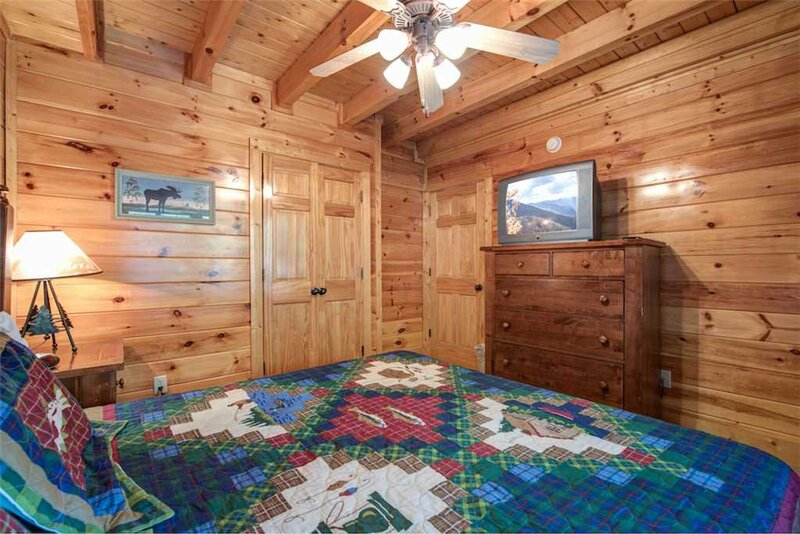 If you’re wondering where the kids—or adults—have wandered off to, check the downstairs game room. 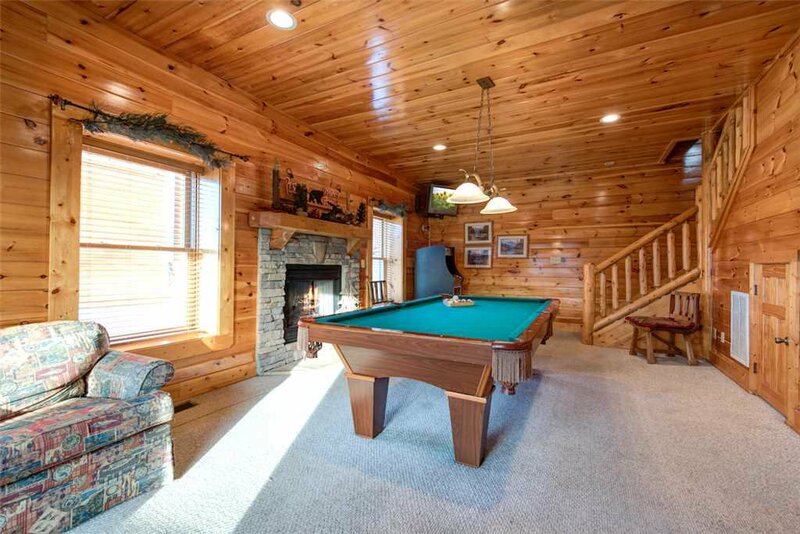 In addition to a full-size pool table, it includes an Xbox and an arcade loaded with classic games such as Ms. Pac-Man, Frogger, and Donkey Kong. 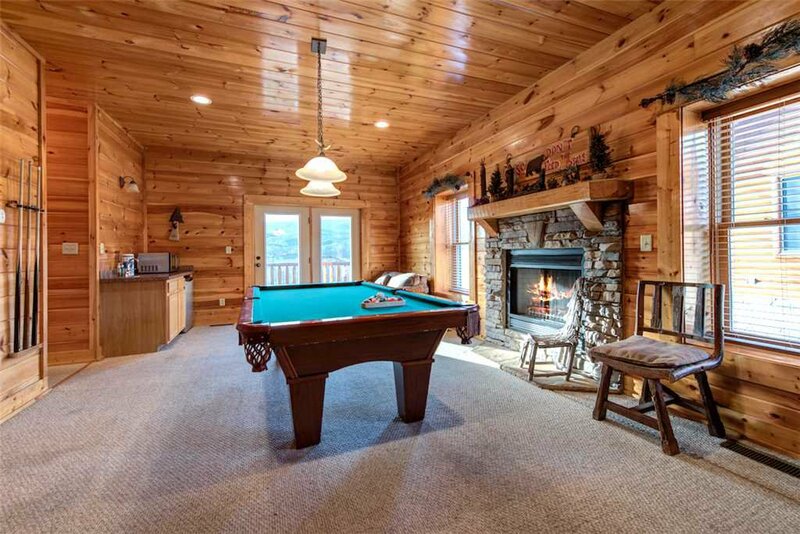 The fireplace, the wet bar, the sofa bed, and the French doors leading out to the lower deck make the room an inviting space for hanging out even when you’re not playing games. 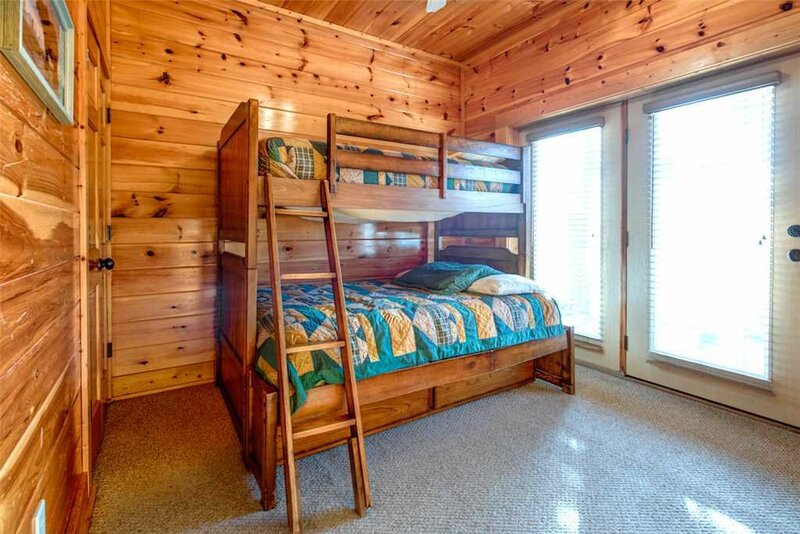 Of Mountain Paws Retreat’s five bedrooms, two feature king-size beds, two have queen-size beds, and one has a twin bunk bed over a full-size bed with a trundle. 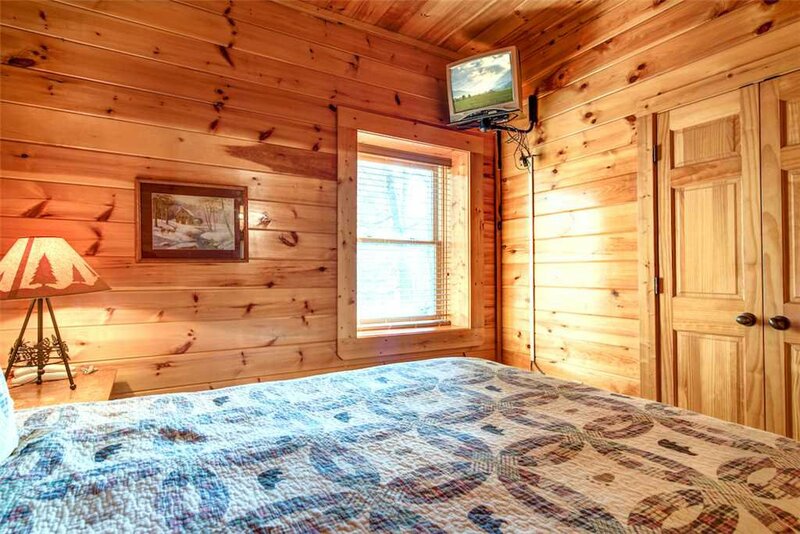 Sofas in the great room and the game room open up into beds as well. 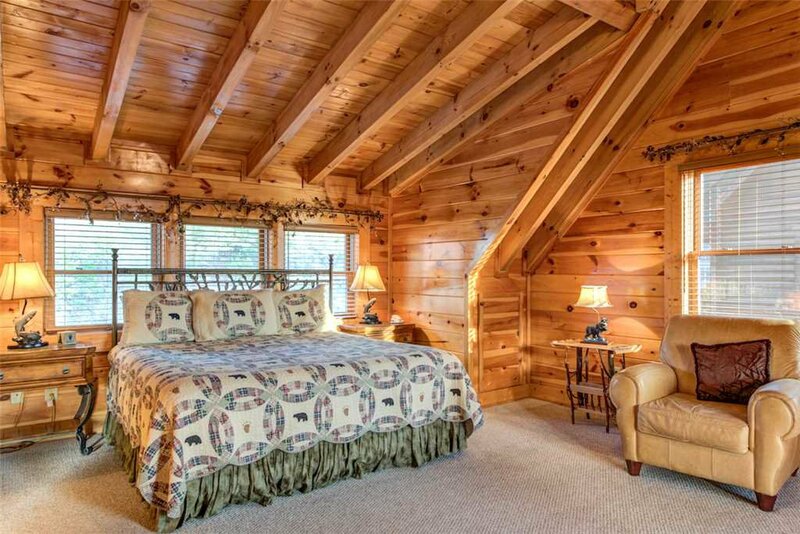 All the bedrooms have a TV and rustic yet refined furnishings, but the huge master suite in the loft is especially luxurious. 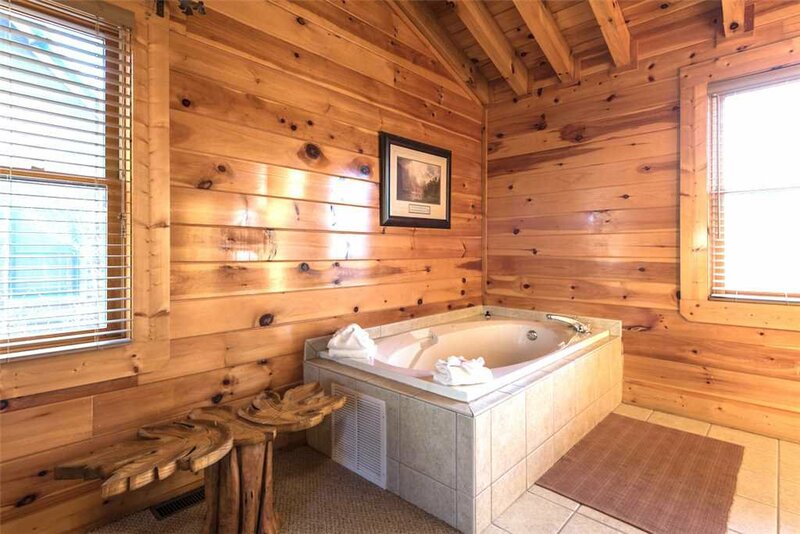 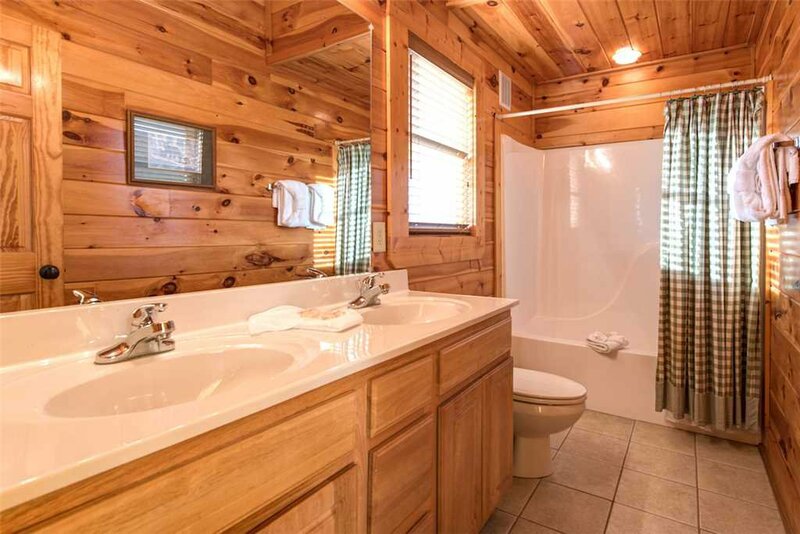 Not only does it include a king-size bed and a private bathroom, but it also boasts a jetted tub. 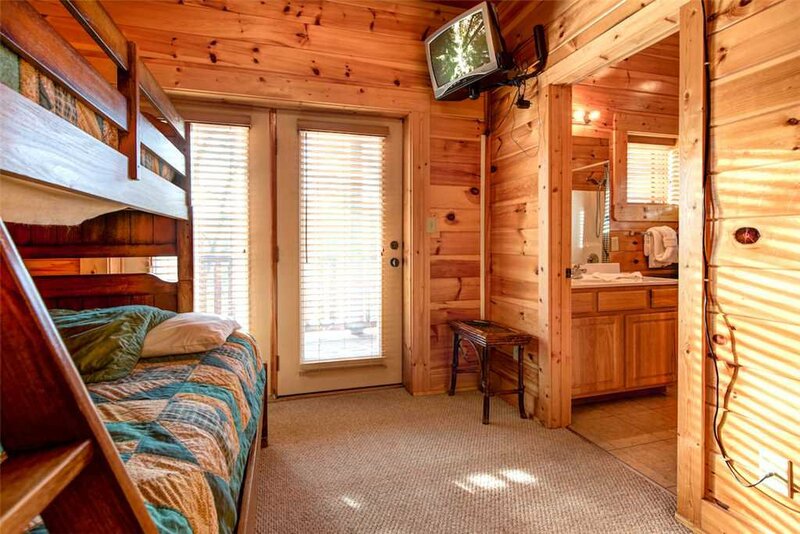 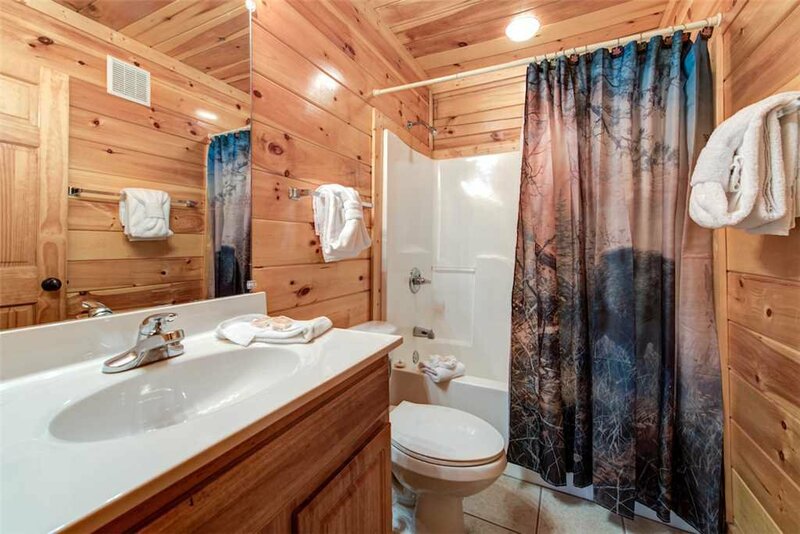 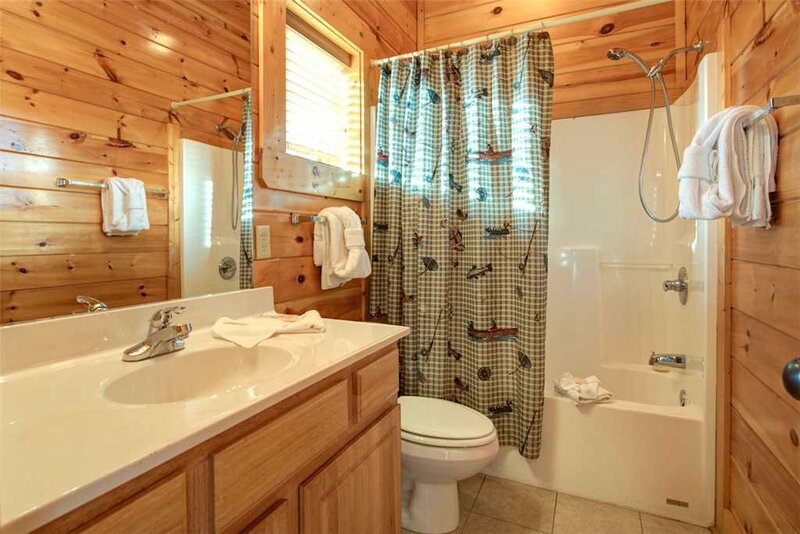 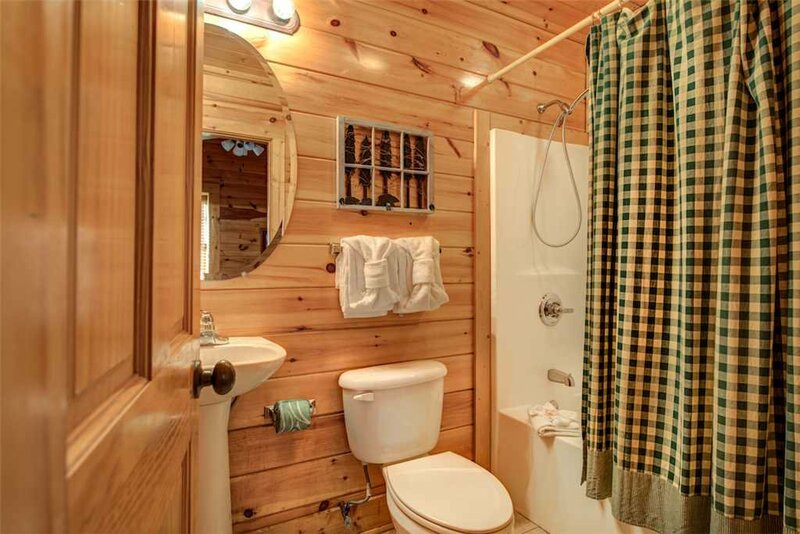 The lodge’s other amenities include three additional full-size bathrooms, free WiFi, and a washer and dryer. 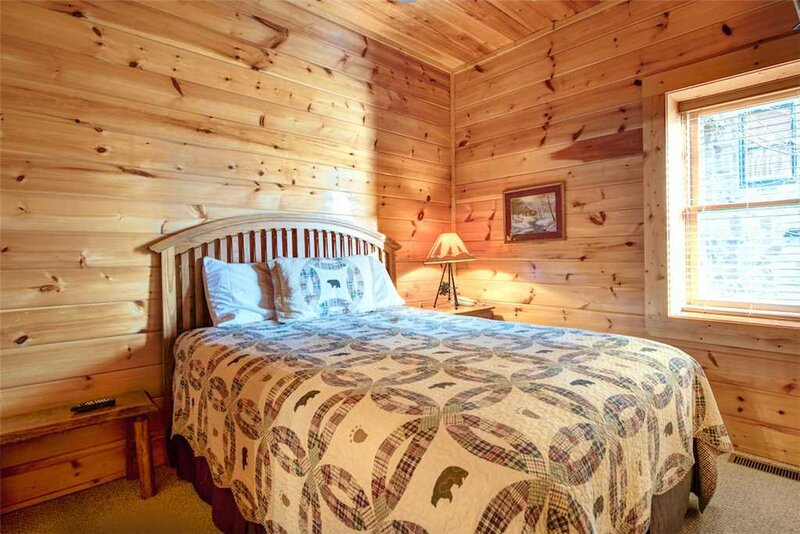 The beds will be impeccably made up by the time you arrive, and you’ll find plenty of extra bedding and all the clean towels you could possibly need. 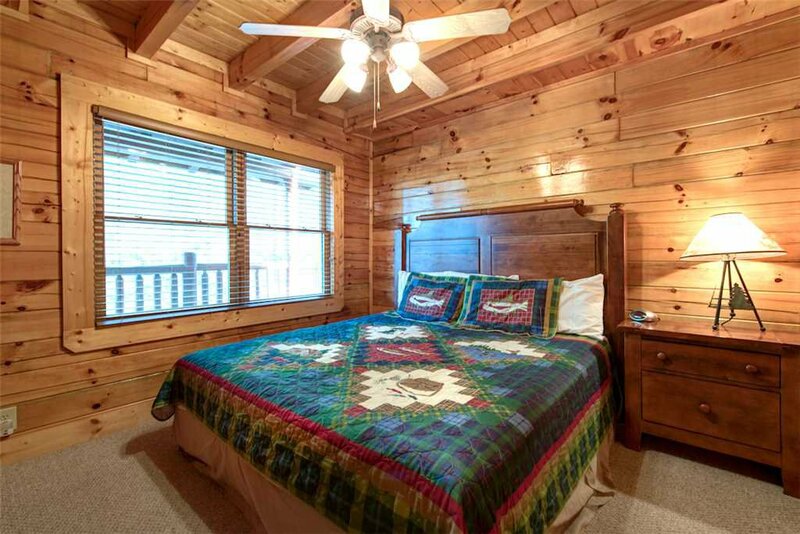 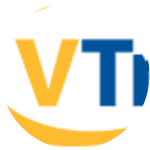 We have you all taken care of, so that you can concentrate on relaxing and making memories with your family and friends—and isn’t that what vacations are all about?